Rudy Eugene and Ronald Poppo CBS/Miami-Dade Police Dept. 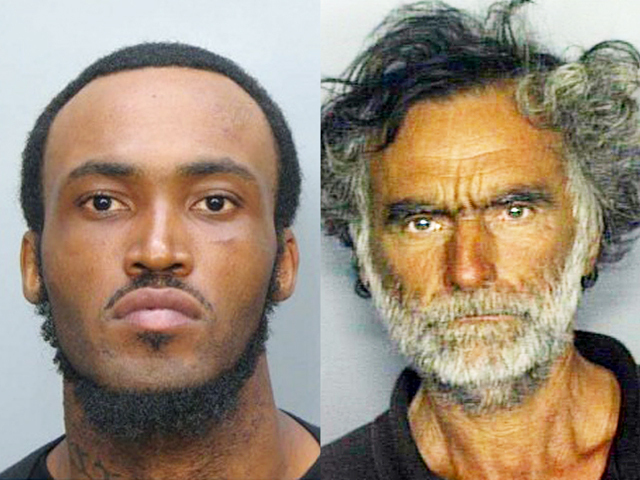 (CBS/AP) MIAMI - Ronald Poppo, the 65-year-old homeless man whose face was mostly chewed off by Rudy Eugene along a busy Miami highway ramp, will require months of treatment to rebuild his facial features and be permanently disfigured. According to experts on facial reconstruction who spoke with The Associated Press, such severe facial injuries are not generally life threatening. The most serious risk to Poppo were the germs that may have been introduced by the bites of the 31-year-old naked man who attacked him. One of Poppo's eyes was also gouged out. It's not clear why Poppo was attacked that Saturday afternoon. Police have released few details but surveillance video from a nearby building shows Eugene pulling Poppo from the shade, stripping and pummeling him before appearing to hunch over and then lie on top of him. A witness described Eugene ripping at Poppo's face with his mouth and growling at a Miami police officer who ordered him to get off the homeless man. The officer then shot and killed Eugene. Eugene's younger brother told the AP that his sibling was a sweet person who didn't drink much or use hard drugs. The brother asked for anonymity to protect his family from harassment. "He had his face eaten down to his goatee. The forehead was just bone. No nose, no mouth," said Sgt. Armando Aguilar, president of the Miami Fraternal Order of Police. Poppo has been in critical condition in recent days but police didn't give an update on his condition Wednesday.